It’s been a busy and interesting summer up here in the Boro. 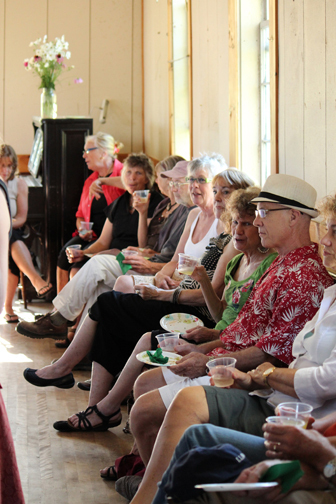 It kicked off with our Funky Fourth of July parade, fireworks, chicken BBQ and the annual gathering of the clans. Our family was here for the whole week, so we were busy trying to keep up with both our community obligations and our family doings. 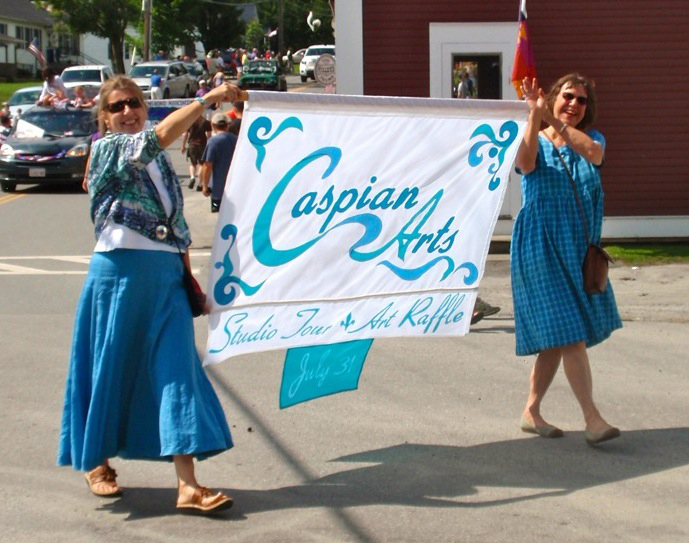 The parade was a funky as ever–the walking ladies won third prize and Caspian Arts kicked off its promotion for our mid-summer event, a studio tour and art raffle. As president of Caspian Arts, it was my idea to organize an event that would introduce our residents, both summer and year-round, to the talented artists who live and work in the area surrounding Caspian Lake. A studio tour offered visitors the opportunity for both entertainment and discovery, while allowing the artists to showcase their art and explain their inspiration and process. The day of the tour, July 31, was beautiful, and many folks followed one of the three routes described on the map. I had 63 visitors in my studio between 10and 5 which kept me hopping all day. Everyone seemed to be having a marvelous time and all seemed to enjoy seeing my wallhangings, the “wall of fabric”, and my many sewing machines. I always enjoy the opportunity to talk about why I make quilts and to explain how I create a full size pattern, meticulously cut, pin and sew each and every piece using a method I developed myself. 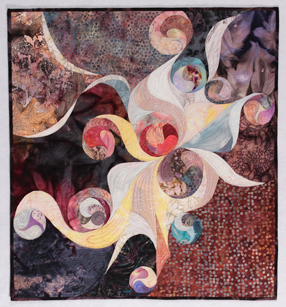 For many first time visitors, seeing my quilts is a real surprise. They are thinking squares and triangles and are surprised to find curvy lines, undulating shapes and painterly colors. At the end of the day, artists and visitors gathered for a celebration party and the art raffle. Each of the nineteen artists participating in the tour donated a piece of art to be raffled. The visitors collected a raffle ticket at each of the studios they visited and these tickets were placed in the raffle. Several of the visitors actually visited all nineteen studios! Excitement was high as visitors viewed the donated art and waited for the drawing to begin. Happy raffle winners went home with valuable artwork that included paintings, silver jewelry, ceramic pieces, encaustic work, gicleé prints and a quilted wallhanging. But all who participated declared the studio tour and raffle a great success. Now we look forward to planning a similar event for the summer of 2013! This entry was posted on Tuesday, September 18th, 2012 at 7:02 pm and is filed under Uncategorized. You can follow any responses to this entry through the RSS 2.0 feed. You can leave a response, or trackback from your own site.